We will give an outreach performance featuring holiday music at Van Dyk Park Place on Friday, November 30, 2018 at 2:00PM. Our Holiday Musicale will be at the Unitarian Society of Ridgewood on Friday, December 7, 2018 at 2:00PM. 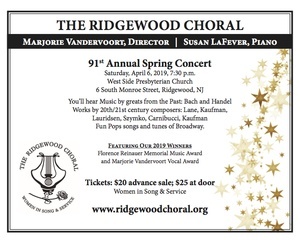 We will hold a special recital at the Unitarian Society of Ridgewood to benefit the Florence Reinauer Memorial Scholarship Fund on February 24, 2019 at 3:00PM. Please scroll to bottom of this page for more information on this event and the performers. We will give an outreach performance featuring selections from our upcoming Annual Spring Concert at New Bridge Medical Center in Paramus, NJ on March 29th at 2:00PM.